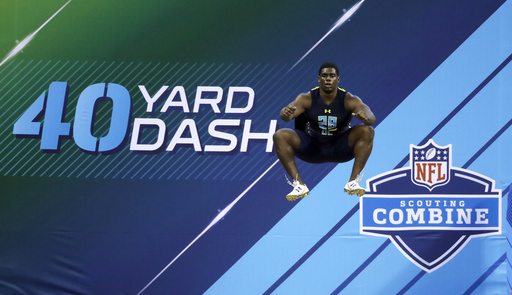 The NFL Scouting Combine begins this week in Indianapolis. It’s the first chance for every NFL to meet, interview, examine and scout the prospects in this year’s NFL Draft. Bob Gaughan looks at the players who have the most to prove to the NFL decisionmakers. QB Josh Allen-Wyoming- his accuracy is a huge question he needs to answer. His footwork will be looked at closely. QB Josh Rosen- UCLA- interviews with teams will be huge. He will perform on the field. Does he come off as arrogant, entitled, does he love football? QB Baker Mayfield-Oklahoma- see above Rosen. It’s not his on-field that he needs to worry about. Teams will have serious questions about is he the guy you want as the face of your franchise? Crotch grab, twitter comments, running away from cops, hitting guy in pregame warm-ups all will be brought up in interviews. QB Mason Rudolph- Oklahoma State- he missed the Senior Bowl with a left foot sprain. How well does he perform, how athletic is he? RB Nick Chubb- Georgia- injury history so he needs to be cleared medically. On the field is he a 3-down back, can he block and catch? WR James Washington- Oklahoma State- he performed well at Senior Bowl but needs to follow up again. No Big 12 corners rated as being drafted in top 5 rounds. All Big 12 receivers need to perform against better competition. TE-Mark Andrews- Oklahoma- has started to slip because of two concerns. Can he block anyone and how athletic is he? Needs to answer these questions this week. OT Connor Williams Texas- had a great 2016 followed up by a disappointing 2017. Injuries played a factor. Biggest question being raised is he a better guard than tackle? Edge-Marcus Davenport UTSA- first time he faced NFL type caliber lineman was the Senior Bowl. His performance was up and down. He needs to perform well to stay in first round. DT-Lowell Lotulelei- Utah- brother of Star. Had maybe the most disappointing year of any NFL prospect this year. Does he care about football? Reputation for being lazy! LB Jack Cichy- Wisconsin- needs to be cleared medically. Missed all of 2017 season with a knee injury. LB Josey Jewell-Iowa- known as a great football player but so-so athlete. He needs to perform well in drills to answer question about how good of an athlete he actually is. CB Holton Hill- Texas- he failed 9 drug tests at Texas. He can’t fail a drug test at combine can he? Interviews key as well needs to come clean. Bob Gaughan also looked at the top five draft prospects on offense and defense.